Happy Memorial Day to my US friends! I hope you are enjoying your day with family and friends, but more importantly remembering those brave men and women who gave up their lives to make this a better world! True hereos indeed! 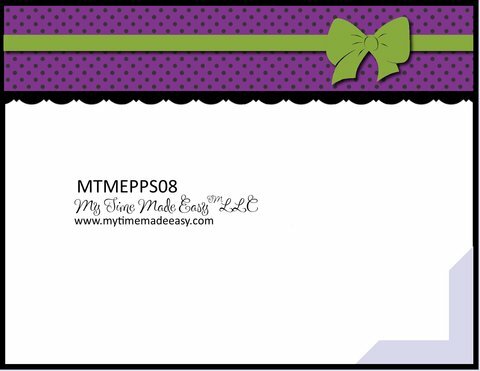 Today is Day 1 of previews for the June My Time Made Easy release. This month is centered around a "movie/DVD" theme. The template I'm sharing with you is called Fresh Popped and it's a fun popcorn container you would see in a movie theatre. Lauren asked us to find other uses for this template. I came up with this fun little container. Thanks for stopping by! I'd love to hear what you think about this new template! Hi everyone! 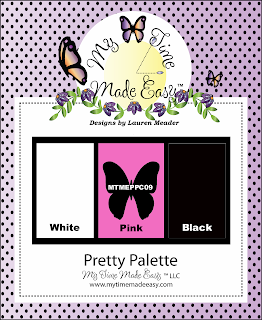 My Time Made Easy has a great Pretty Palette challenge for you today! The colors remind me of a sunny day! These colors are so fresh and fun, don't you think? Here's my rendition of them. 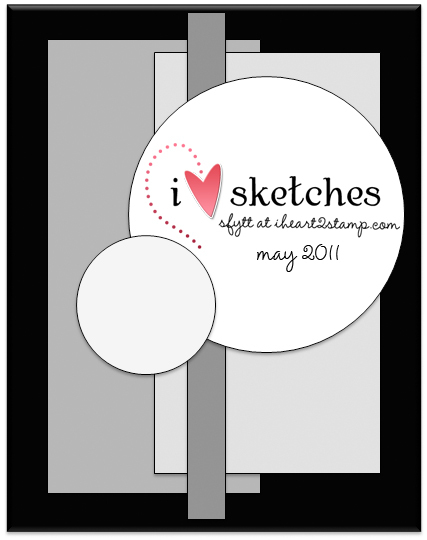 I started with this month's sketch from Jen del Muro's Sketch for You to Try. The dp is from MTME called Bee Mine. This pretty image is from the newest MTME set called Bee-Loved. It's colored with copic markers. 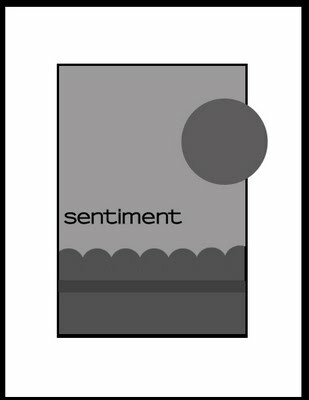 The sentiment is from Sensational Sentiments. I added the satin yellow ribbon tied with a Bow Easy. The Pretty Palette design team has done another wonderful job with these colors. 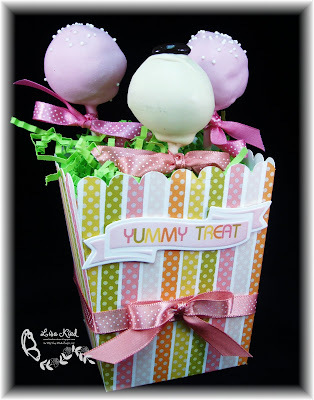 Check them out at their blogs and go to the MTME blog to enter your creation! Hi everyone! It's Saturday (yeah!) and I'm on day 2 of a 4 day weekend! We are celebrating Memorial Day at our cabin...I hope the weather is dry for a change! We'll see! 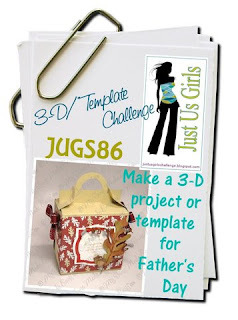 This week is the Just Us Girls template/3-D challenge, and Andrea has challenged us to make a Father's Day project. So nice to get projects done ahead for these holidays for a change! 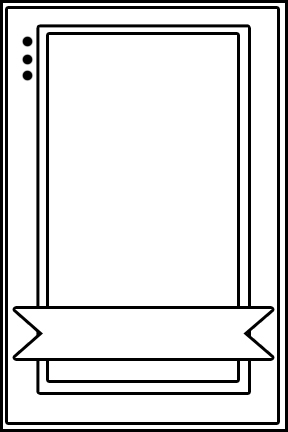 I immediately thought of this Trendy Tool Tote template from My Time Made Easy. I started with a chocolate base and added the decorative panels in river rock and ran it through a Cuttlebug folder. It made it more masculine, I think. 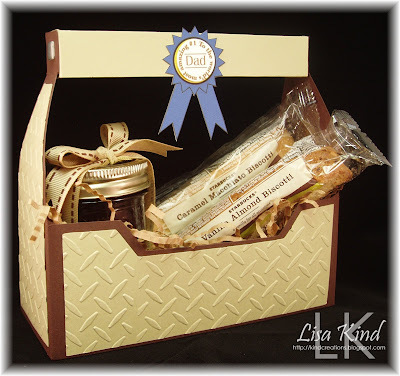 I added a ribbon and sentiment from the For Dad digital set, also from MTME. 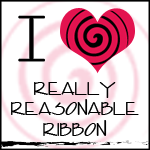 I colored the ribbon in GIMP and then added the sentiment, which was also colored in GIMP. This is going to be for my father-in-law. I didn't include any tools or anything for him. He's almost blind from glaucoma, so it's sometimes difficult finding gifts for him. He doesn't really like breakfast, but likes toast and his sweets. So, I added a jar of homemade jelly (this was given to me, not made by me!) and some biscotti. And he LOVES coffee, so I purchased some coffee for him. The colors of my tote were inspired by the coffee bag, and when I finished the template, I realized that the bag was too tall to fit in the template! LOL!! You have to see what the JUGs design team has done...some fabulous projects as usual! Stop by the JUGs blog to see for yourself! Hi everyone! I'm so glad the world didn't end yesterday because I have a really cute card for the Pretty Palette color challenge today! :-) The colors where chosen from two My Time Made Easy digital paper packs called Cheerful Chirps and Cheerful Musical Magic. My card uses the My Little Friend digital set. I even colored it digitally in GIMP...I'm getting better at it, but I still need some practice! I also wish I had given her some rosy cheeks! 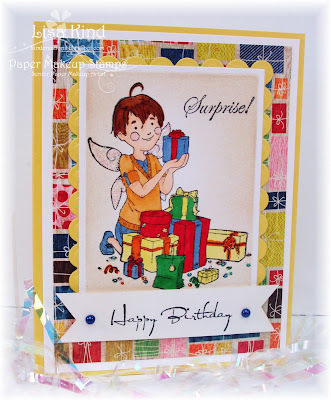 I used the Bloom Burst pattern from the Cheerful Chirps paper pack. After I printed it out and cut and embossed it with a rectangular nesite, I masked the image and sponged in some clouds behind her. I did the same with the sentiment. The layout is the Fall to Layout #141. I'm also entering this in the 2 Sisters Challenge...to use a digital image. If you want to see more fabulous inspiration, please stop by the MTME blog and see what the design team did with these colors. Thanks for stopping by today! Enjoy your day since you thankfully have many more to enjoy in the future! Happy Saturday! It's time for another Just Us Girls challenge. 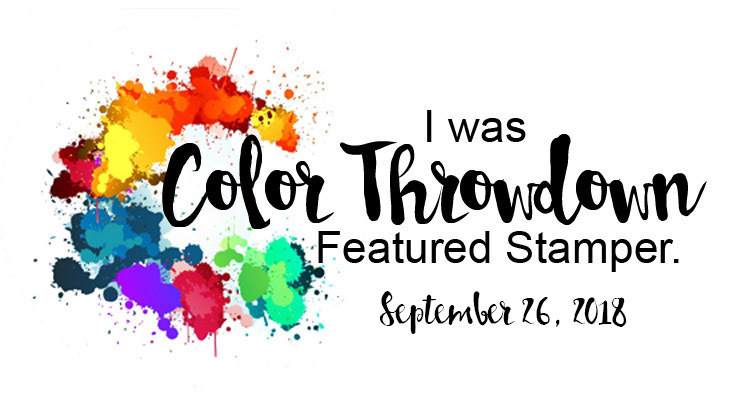 This week, Dana is challenging us to use a rainbow of colors! Isn't this graphic just so fun? Kristin did a fabulous job with it! Here's how I used a rainbow of colors on my card. I found this great sunburst tutorial by Shannan Teubner that I thought would be perfect for this challenge. I used June Bug papers from Basic Grey. They looked like they contained a rainbow of colors. The senitment is from Raindrops and Rainbows by Paper Makeup Stamps. It's so appropriate here in Buffalo this spring. We've have over 15" of rain....the most rain since 1991 for spring! It seems it's raining and cold everyday! I need some sunshine!! The JUGs girls and guest designer Clare Buswell have done a fantastic job with their rainbow cards! 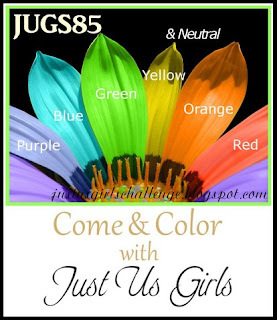 Stop by the JUGs blog and take a peek! We hope you can play with us this week! Thanks for stopping by and I hope you have warmth and sunshine where you are! Hi everyone! This post was supposed to go up at midnight today, however I forgot to write it last night! I was so engulfed in American Idol (I watched Wednesday's show as well as the results show) then Grey's Anatomy and fell asleep! So I apologize to my CSAYL team! 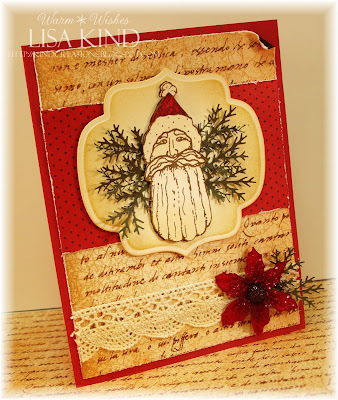 The challenge this week on the Christmas Stampin' All Year Long challenge is vintage! I love how some of you do vintage...for me I had a difficult time with this one for some reason, but I do like the outcome in the end. I went in search of some images that looked vintage, and I had one that I was trying to get to work for me, but it just wasn't doing it. Ever have that happen? Then I found this unmounted stamp that I purchased last summer at a stamp expo here in Buffalo. I remembered that they put these sprigs of fern behind the image, so I ran with it. The script paper is from the Botanicabella collection by Graphic 45, and the red piece is from SU's retired Holiday Treasures. I used a Tim Holtz tool to shabby up the edges of the papers. I followed a layout from another card I did a while back. We didn't have a sponsor this week, so we don't have a prize giveaway, but you do have the chance at being a guest designer for the month of June! So we hope you join us! 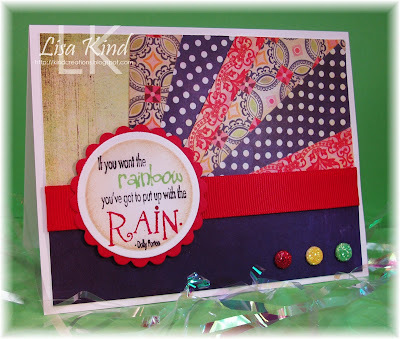 Stop by the CSAYL blog to see what the girls have done with this Very Vintage challenge. Thanks for stopping by! Have a great weekend! Hi everyone! Are you interested in joining a fabulous design team for a great rubber stamp company? Well, Paper Makeup Stamps is looking to expand their design team. You can find all the details on the PMS blog here. I've been a member of this team for 2+ years and it is one of the best around! We hope to hear from you! Thanks for stopping by and have a great week! Happy Sunday! It's raining here in Buffalo....we really are in need of some sun! Enough rain already! I need to get into my garden! But if I can't do that, I could open a bottle of wine and relax. That's what I was going for in my card today. 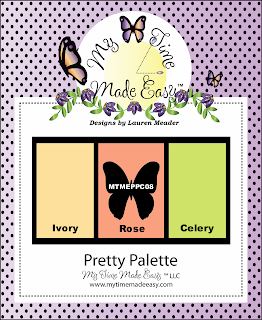 Today begins a new color challenge over at the My Time Made Easy Pretty Palette challenge. The colors for this week are very Parisian to me...don't know why, but that's what I think of when I think of white, pink, and black. So I created this scene reminiscent of a bistro in Paris. I used the Lil' Cafe stamp set from MTME and all the little stamps in the set that allow you to create any type of cafe/bistro your heart desires. I had this stamp set in mind when I chose this color palette. I used 7 different stamps from this 30 piece set to create this scene. I love wine, so it was a natural choice for me to use the wine bottle and glass! The Pretty Pattern sketch from this week was the perfect sketch for creating a scene. I just had to leave off the corner piece. 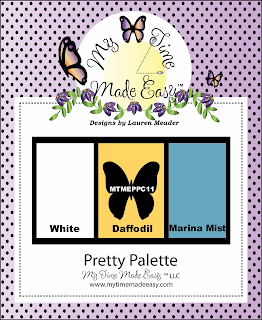 Stop by the MTME blog to see what the design team created with these colors. They are amazing me every week with their designs! Very lovely and creative, indeed! Thanks for stopping in today. I hope you are dry and enjoying some sunshine for me! Hello friends! 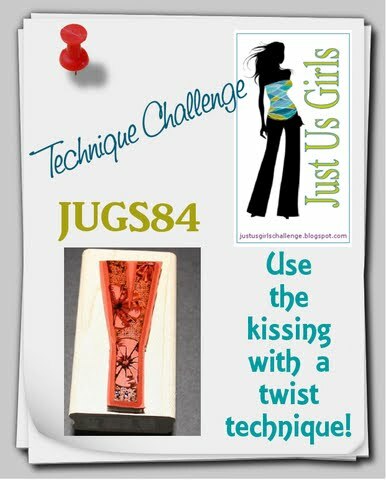 Just Us Girls has a great technique challenge this week brought to us by Kristin! The challenge is Kissing with a Twist. If you haven't tried this, you really should because you get a really cool look...almost a batik look! You can find the tutorial here on SCS. To achieve this look, you need a stamp with a solid surface. I used this image from PTI's Modern Basics stamped in Marigold Morning ink and then kissed it with a twist using a tri-circle image from Men of Life in Wild Wasbi ink. The sentiment, from Big Birthday Wishes, was also stamped in Wild Wasabi ink. I added the score lines and the glitter strip to fill up some of the white space. 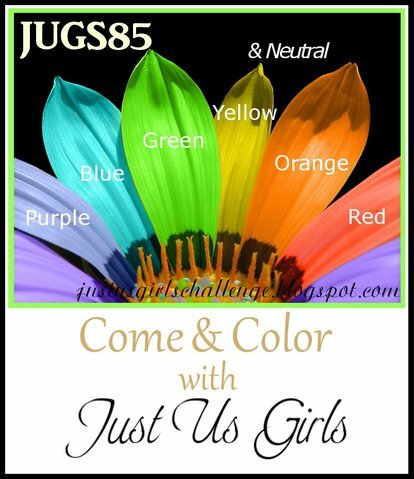 The JUGs girls and guest designer Clare Buswell have done a fantastic job with this technique, so please make sure you stop by the JUGs blog and check it out! Happy Friday everyone! 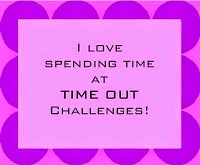 Well it seems Blogger was misbehaving and wouldn't let me get this post up until now (after work and dinner)! We have a new sponsor this week at Christmas Stampin' All Year Long: Sew Many Cards and Digital Stamps has some fabulous images! I love the image I chose called Halen in Mitten. Cute, huh? The challenge at CSAYL this week is "You've Got Me in Stitches", so faux stitching on the card is what I did. I always seem to have trouble with my cheap-o sewing machine lately. My needle is constantly coming unthreaded and I find it terribly difficult to thread it again, so I shy away from the real thing! On this card, I used my ruler and white gel pen for this challenge. The paper is a retired one from SU called Christmas Cocoa. I love this paper and sad that I only have a little left! The cardstock is soft suede...another one I love. The ribbon is something from my collection, and the buttons were created using the dp and PTI's button die. The sentiment is from The Gingersnaps from My Time Made Easy. I used a Creative Memories heart punch. 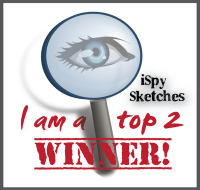 The image was colored with copics, cut out, and popped up on the circle. The sketch is from May's Sketch for You to Try. So how are you doing on your Christmas cards? Gotten started yet? This is my 11th card for my stash, and I have a big smile on my face! If you start playing with us at CSAYL every week, you'll have a get head start on getting those cards done! You even have the chance to win 5 digis from Sew Many Cards! Thanks for stopping by and I hope to see you over at the CSAYL blog! Hi everyone! Today is the last review day for the Paper Makeup Stamps May release. It's been a great release, with some different images being released. You can view the entire release here. I have a new fairy to share with you today. This is Lars with all his wonderful gifts! I found this pattern paper in the Life is Good paper pack from Basic Grey and colored Lars and his gifts to match. The yellow cardstock is one of my new favs from SU called Daffodil Delight. I'm lovin' the bright colors of this card. 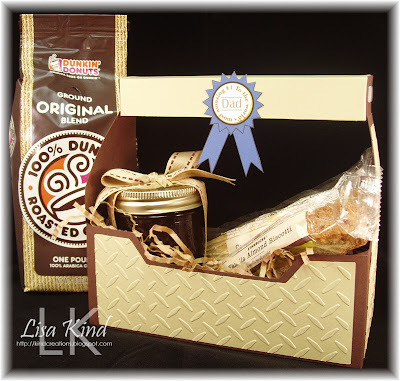 The "surprise" sentiment is this month's freebie with every PMS order. 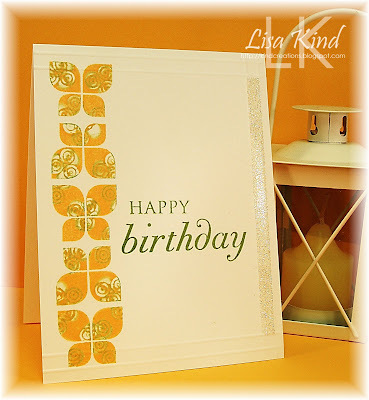 The "happy birthday" sentiment is from a new set called Celebration Sentiments. 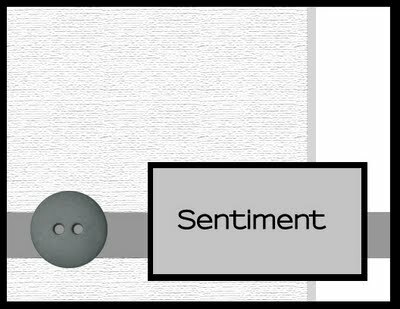 I chose to use the sketch from Card Positioning Systems. Nice and simple, plus I love the banner! Stop by the PMS blog to see what the other girls are reviewing! Thanks for stopping by today! 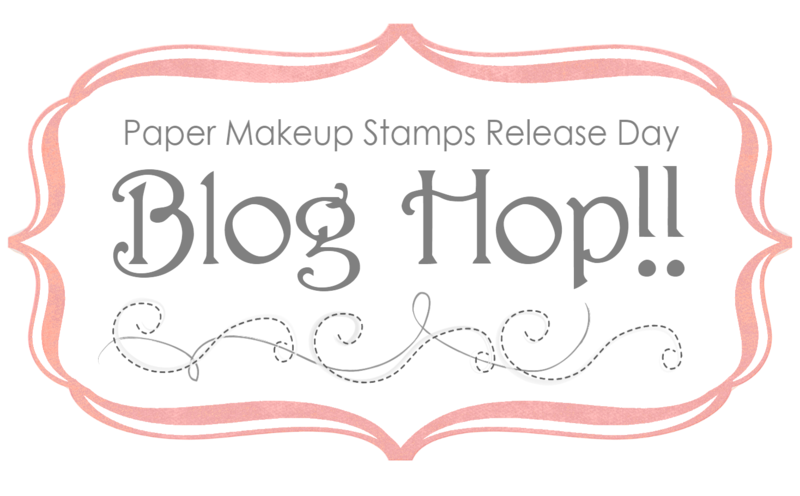 Have you seen the new release from Paper Makeup Stamps? You can find all of them here. Today and tomorrow the PMS design team is reviewing the new release. You can see them on the PMS blog. The one I have to share with you today is one of my favs of the release. There were two of the fairies that were released in silhouette form. This is Kirsten Silhouette. This card came together in a flash! 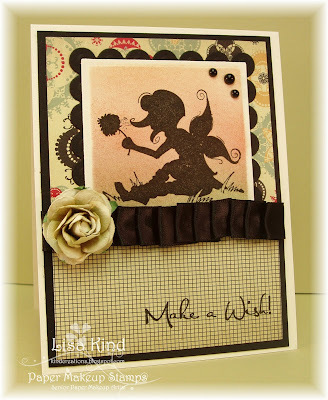 I stamped Kirsten on vintage cream cardstock using Versafine Onyx Black ink. That ink is perfect for silhouettes...gives great coverage. I swirled some artichoke ink on the bottom of the image, then red, orange, and a yellow-orange ink on the background for a sunset look. The dp is Cosmo Cricket's Circa 1934. I ruffled the black satin ribbon (which is crooked!) and added a Prima rose in a sage color. 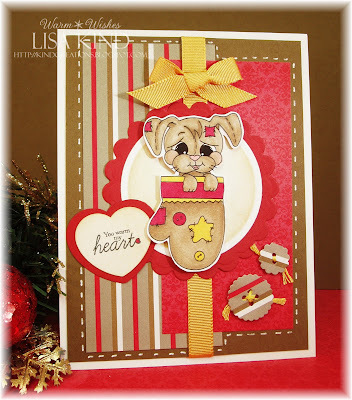 The sentiment is from the new Celebration Sentiments set. The layout is from this week's Mojo Monday sketch. Please stop by the PMS blog to see more of the reviews by the PMS team. Thanks for stopping in today! Hi all! Did you all enjoy Mother's Day yesterday? We had a nice time until I was driving home and was stopped by one of our finest! I've NEVER gotten a speeding ticket and was hoping to continue my streak. The nice officer just gave me a written warning! I've never heard of that, but thank goodness for it! 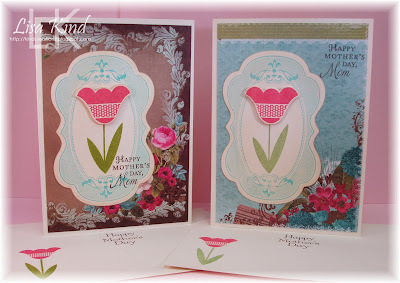 Here are the cards I made for my mom and my mother-in-law. I was pressed for time and made these early in the morning yesterday. I didn't want to color or do anything too fussy because I was short on time, so I took out this Wishing You set from Papertrey Ink. My card is 6.25" x 4.5", so these 6x6 papers by Prima called Madeline, fit perfectly on the card. You can see that the dp is doing most of the work! The label, from Lovely Labels 2 by Gina K Designs, was stamped in Cool Caribbean, then I stamped the tulip leaves in the center. 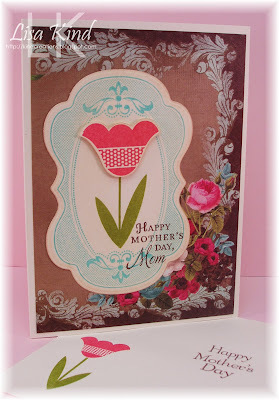 The flower was stamped, cut out, and popped up on the card. 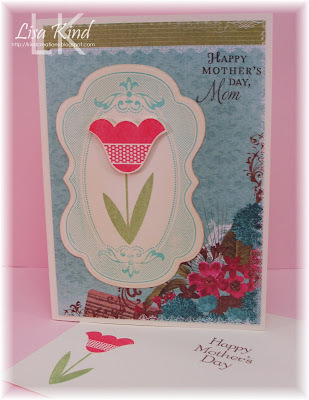 The sentiment on the card and envelope is from Motherly Love by Flourishes. This one is my favorite. I love the brown with the pink and aqua. This dp was a little busier, so I had to stamp the sentiment on the label. I like the look! Thanks for stopping in today! Hope you have a great week! Happy Mother's Day everyone! I hope you are enjoying your day! I'll be at our cabin celebrating Mother's Day with my family! This week's Pretty Palette color challenge focuses on spring-ish colors. I had these papers from October Afternoon in mind when I chose these colors. I've had this Bee Loved cut file stamped with this tulip from the Bee-Loved stamp set for a while and decided to use it on this card. I colored it with copic markers to match the challenge colors. 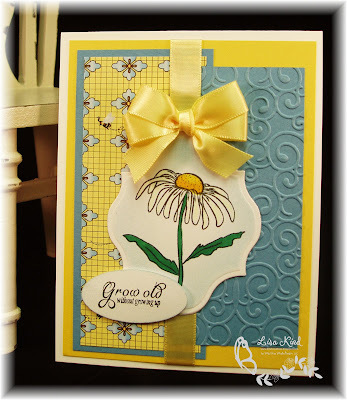 I paired it with this sentiment from the Bold Botanicals stamp set. I stamped it in Versafine black onyx ink....I had forgotten how lovely that ink is. It gives such a sharp crisp impression when stamped. I used certainly celery twill ribbon and colored the pearls with the same copic marker I used on the tulip. Really quick card! 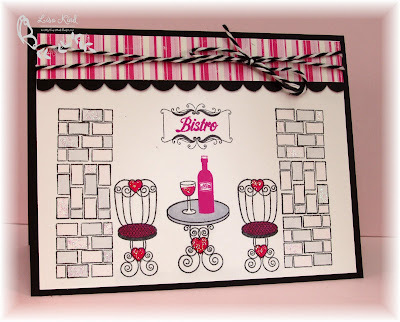 The girls from the Pretty Palette design team did a knock-out job on this challenge this week! Please stop by the MTME blog to see their creations. Happy Saturday! I have a two-fer for you today! 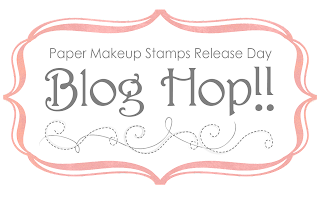 It's release day for Paper Makeup Stamps and that means it's also our blog hop! You should have arrived here from the PMS blog. If not, start there to get all the details about the hop. Today also begins a Just Us Girls challenge for this week, and it's a sketch challenge...one of my favorite challenges! Pam is the hostess and here's her sketch. I love how funky this sketch is! That panel on the left is so cool! 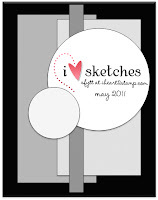 I used this image from Tweet Things by Paper Makeup Stamps. I'm showcasing the new sentiment stamp set called Build a Sentiment set. 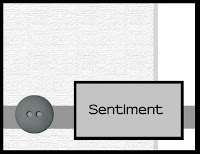 It has a bunch of words that you can link together to create a special sentiment. It has family words in it such as Husband, Wife, Niece, Nephew, etc. It's one of those sets that you always wish you had and that you'll use over and over again! The paper is from Cosmo Cricket called Circa 1934. I used the Bow Easy to make the double bow out of black satin ribbon and added the red button. It's threaded with some Scrapper's Floss. I've seen other crafters using it and I had to pick some up! It's a fun new accessory for me. The bling is a $1 item I found at AC Moore. You can see what the JUGs DT did with this sketch on the JUGs blog. I'm so happy to be back playing on this challenge after taking a much needed two week break! But I did miss my JUGs girls! I want to remind you of our Release Party tonight over in the Paper Makeup Stamps forum. There's always great chatter, prizes, and games going on (and someone always brings cheesecake, too!). It starts at 9:00 pm EST, so we hope to see you there! 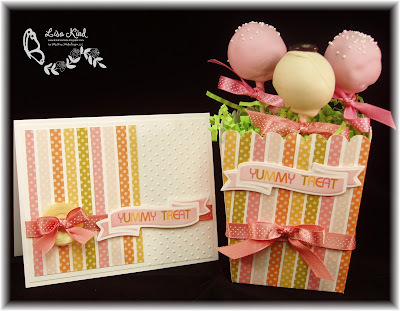 Now I'm going to send you on your way hopping over to Christi Snow's blog to see her fabulous creation! I don't have a letter for you, but Christi will! Have a great weekend and thanks for stopping in! A Honey of a Post!